Foraging for wild plants and hunting wild animals is the most ancient of human subsistence patterns. Prior to 10,000 years ago, all people lived in this way. 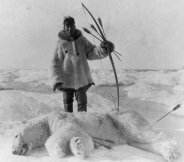 Hunting and gathering continued to be the subsistence pattern of some societies well into the 20th century, especially in environmentally marginal areas that were unsuited to farming or herding, such as dense tropical forests, deserts, and subarctic tundra . Earlier foragers also occupied productive river valleys in temperate zones until these areas became farmlands during the last 5,000-8,000 years. Foragers generally have a passive dependence on what the environment contains. They do not plant crops and the only domesticated animals that they usually have are dogs. These useful animals often have multiple functions for foraging peoples. They serve as pets, hunting aids, watch-animals, camp refuse scavengers, and even surplus food when needed. Some foragers in East Africa and Western North America are known to have periodically regenerated the productivity of their environments by intentionally burning grasslands and sparse woodlands. This encouraged the growth of tender new vegetation which attracted game animals. It is likely that controlled burns of this sort were used by foragers elsewhere in the world as well. Foragers rely mainly on their own muscle power in carrying out their subsistence tasks. Most labor is done individually or in small groups of relatives and friends. There is an almost a complete absence of occupational choice. Every man is primarily a hunter of animals and every woman is mainly a gatherer of plants. Economic roles are mostly based on gender and age. However, it is not unusual for some tasks to be performed by either men or women. Gathering of firewood as well as collecting mollusks, insects, and other small game for food are often non-gender specific activities. Most foraging societies do not establish permanent year-round settlements. Rather, they have relatively temporary encampments with tents, brush huts, or other easily constructed dwellings. The length of time that they stay in any one location is largely determined by the availability of food and water that is readily obtainable. In regions that experience seasonal variations in climate, foragers usually carry out a round of migrations determined by the resources that can be exploited at particular times of the year in different areas of their territories. In this way, they increase the amount of food and can support somewhat larger populations than otherwise. However, their migrations are limited by the fact that most foraging societies travel on foot. Foraging population densities are very low compared to other subsistence patterns. In harsh, relatively unproductive environments, densities of foragers have been as low as one person per 10-50 square miles. In rich environments, the densities have been as high as 10-30 people per square mile. The optimal community size usually is about 25-30 people, depending on the availability of food and water. However, the band size tends to stabilize well below the carrying capacity of the local environment. Social factors rather than food scarcity usually limit the community size. With increased numbers of people, there is increased potential for social conflict. The result is a splitting of the band. Fissioning of the community into two bands that go their own way has the effect of preventing a large population concentration that could strain the carrying capacity of the environment. Equestrian and aquatic foragers have specialized subsistence patterns. They focus their food getting efforts on a limited range of species. This allows them to become very efficient at harvesting them. As a result, they usually have abundant food supplies and larger communities than pedestrian foragers. However, there is a downside to a specialized subsistence pattern. It can be a precarious way of life in a changing environment. An epidemic or other catastrophic event can rapidly reduce the numbers of animals that are the focus of the hunt. In contrast, the diversified subsistence approach of most pedestrian foragers has the advantage of relative economic security if there are fluctuations in the weather, water supply, or periodic die-offs of the food sources. The disadvantage of a diversified subsistence pattern is that the total amount of food calories acquired is often less and the amount of time required to secure them is greater. The general foraging way of life described above mostly fits the pedestrian pattern. This has been the commonest form of hunting and gathering. At one time, pedestrian foragers lived on all continents except Antarctica. Prior to the invention of agriculture around 10,000 years ago, almost all people lived in this way. They occupied the rich fertile valleys, hills, and grasslands. By the early 20th century, however, this subsistence pattern survived only in marginal areas that farmers and herders were not able to or interested in exploiting. The most well known pedestrian foragers were the Australian Aborigines, the San speakers of Southwest Africa, the pygmies of West Central Africa, most California Indians, and the Paiutes of the Great Basin in Western North America. Other pedestrian foragers lived in marginal areas of Asia, Africa, and the Americas. Surviving pedestrian foragers have been heavily impacted by large-scale agricultural societies. Few if any of these foragers are still following their old subsistence pattern exclusively. The pedestrian hunting and gathering way of life was highly mobile. Most of these societies moved their camps several times a year and had temporary dwellings. The number of people living in a camp also often varied throughout the year depending on the local food supply. Material possessions were generally few and light in weight so that they could be transported easily. Subsistence tools included such things as simple digging sticks, baskets, spears, and bows and arrows that could be easily replaced when needed. This settlement flexibility is an efficient way of responding to changing environmental opportunities. Equestrian foragers have evolved in only two areas of the world--the Great Plains of North America and the sparse grasslands of Southern Argentina. In both cases, pedestrian foragers acquired horses from Spanish settlers in the early 17th century. Over several generations, horse breeding and riding skills were honed. This resulted in a revolutionary change in these Native American societies. 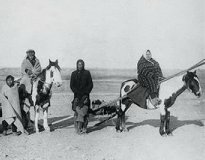 The horse became the principle mode of transportation and dramatically increased hunting success in the pursuit of big animals. These societies became larger, more mobile, and were now able to travel over larger areas throughout the year. Horses allowed them to effectively follow the seasonal migrations of large herbivores over hundreds of miles. In North America the prey of choice for the Sioux , Crow , Cheyenne , and others was the bison or buffalo. In South America, the guanaco was hunted by the Tehuelche . Guanacos are camelids related to the domesticated llamas, alpacas, and vicu�as. The equestrian foraging societies became male dominated and warlike. This was particularly true on the Great Plains of North America after the widespread acquisition of guns in the 19th century. Raiding other societies to steal horses and defeat enemy warriors was the principle path to respect and success for men. Their societies acquired hierarchical , almost military-like forms of political organization with chiefs at the top. In contrast, pedestrian foragers are comparatively peaceful and have very democratic political systems that usually lack fulltime leaders. The combination of aggressiveness and high mobility made it very difficult for the U.S. and Argentine armies to subdue the equestrian foragers during the last half of the 19th century. In both countries, it required a number of army regiments with rapid fire guns and light artillery. 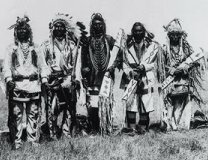 In the case of the North American Plains Indians, decimation of the bison herds at that time by non-Indian hunters was the most important factor in subduing them because it destroyed their traditional subsistence base. All equestrian foragers were forced to move from their homelands to relatively small isolated reservations. Today, their survivors are mostly living in poverty with little hope for their future. Aquatic foragers focus their subsistence activities on fish, mollusks, crustaceans, and/or marine mammals. The most well known aquatic foragers lived on the Northwest Coast of North America from the Klamath River of California to the Aleutian Islands of Alaska. These societies specialized mostly in salmon fishing along the rivers and hunting seals and whales off the coast. 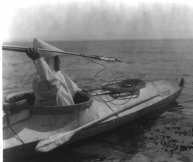 Other aquatic foragers occupied the coastal regions of the American subarctic, the Channel Islands of Southern California, the southern tip of South America, the coastal areas of Eastern Siberia, and a few other regions of the world. The exploitation of fish and other marine resources is usually a far more reliable and productive form of foraging than the diversified hunting and gathering of most foragers who live away from the coasts and major rivers. 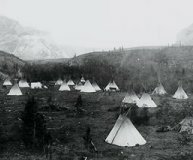 Among the Northwest Coast Indians, settlements were usually permanent. On Vancouver Island in Western Canada, the Kwakiutl and some of their neighbors built split plank wood homes and large community halls for ritual performances, dances, and feasts. They had the leisure time to invest considerable effort in creating elaborate clothing, masks, and large wood carvings (e.g., totem poles and boxes). They also had relatively complex social stratification for foraging peoples. Politically powerful men had titles and privileges reminiscent of Medieval European lords. Today, many aquatic foraging societies continue exploiting marine resources but as part of the international economy. They fish commercially with well equipped modern boats and sell most of their catch to buy things that they do not produce themselves. Apparently, no aquatic foragers still solely practice their traditional subsistence patterns. 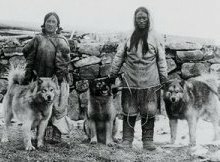 The most common image of the hunting and gathering way of life until recently was that of an uncertain existence in a harsh environment and a short miserable life. This view was more of an ethnocentric projection than an accurate description of the lives of foragers. It was based on our tendency to pigeonhole human societies in terms of an outdated evolutionary framework. It was assumed that if the technology is simple then life must be grim. It was a vestige of the Victorian belief that our "civilized" lives are not only more efficient but also more comfortable than those of "primitive" peoples. Ethnographic research carried out over the last half century has largely demolished this myth that foragers in the past had to struggle for existence. 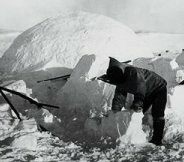 In fact, they usually had a food supply that was adequate and reliable. Most of them only had to expend minimal labor to provide for their basic needs. What is particularly surprising to people in industrialized nations is that foragers often lived well into old age with few signs of anxiety and insecurity. Outside of the subarctic , most foragers subsisted mainly on nuts, vegetables, fruits, and even protein rich insects. Hunting large animals was relatively unreliable. Among the San speakers of the Kalahari Desert in Namibia and Botswana, 60-80% of the diet came from non-meat sources, especially nuts and roots. Since women provided most of the vegetable foods, they were responsible for the majority of the calories that were consumed. Men mostly provided the most desirable food, which was meat. The San way of life was remarkably efficient. While they had few days that were free of subsistence activities, the ratio of labor expenditure to production was low. The ethnographer Richard Lee discovered that adult San spent only about 2� days of 6 hours each week hunting and gathering. Young people did not fully join the work force until around 20 years old. The 60% of the society that were healthy adults, provided the food for everyone by working only 15 hours a week. Foragers have rightly been referred to by Richard Lee as the most leisured people. In the United States today, less than 1% of the population produces all of the food for the entire society. Given this remarkable efficiency, it is worth asking why the rest of us work 40-50 hours a week, often with considerable psychological stress. Foragers often have long lives compared to people in the industrial societies of the 19th and early 20th centuries. Richard Lee discovered that 10% of the San were over 60 years of age and the elderly, blind, senile, and crippled were supported by their families. In the United States today, 10-15% of the people are over 60 and life expectancy is in the low to mid 70's. However, living to an advanced age in the Western World is a very recent trend primarily resulting from modern medicine. In 1900, the average life expectancy in the United States was only 50. At the time of the American Revolution, it was 35. By comparison, the San lived relatively long, healthy lives. Note: The most well known San speakers of southern Africa are the !Kung or Ju/'hoansi . They maintained their traditional foraging way of life into the 1960's. Since then, they have been increasingly forced into smaller territories that are not adequate to support their population by foraging. Today, most of them are poor subsistence farmers in Namibia. In 2002, the government of Botswana drove their surviving San foragers out of the Central Kalahari Desert because they continued to hunt in what was declared a game reserve. In 2004, a delegation of these San went to Washington D.C., the World Bank, and the United Nations to plead for help. They were hoping that world public opinion would force Botswana to allow them to return to what has been their homeland probably for the last 20,000 years. Few have paid heed to their appeal. This page was last updated on Monday, October 30, 2006. Copyright � 2001-2006 by Dennis O'Neil. All rights reserved.